MGame uses FLTK 1.3.4 (C) 1996-2017 - Bill Spitzak and others. Please take no undeserved credit and assign me absolutely no blame. Otherwise, this a free program, download, redistribute, and use at your own risk. 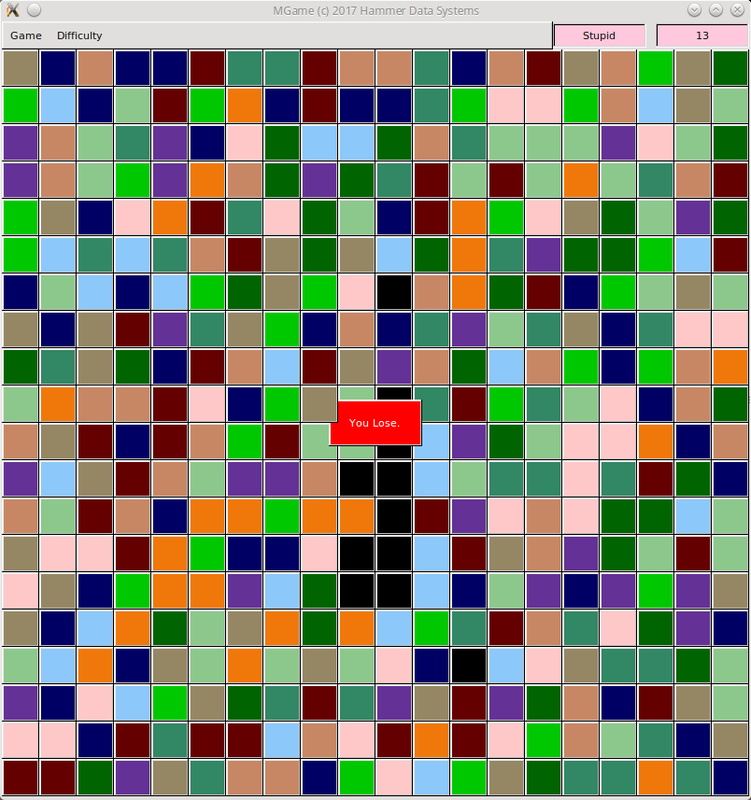 MGame is a simple color matching game. The game is played on a grid of 20 x 20 rectangles. If you match four squares horizontally, vertically, or in a box, those squares are eliminated and the squares above them "fall" into the opened space. 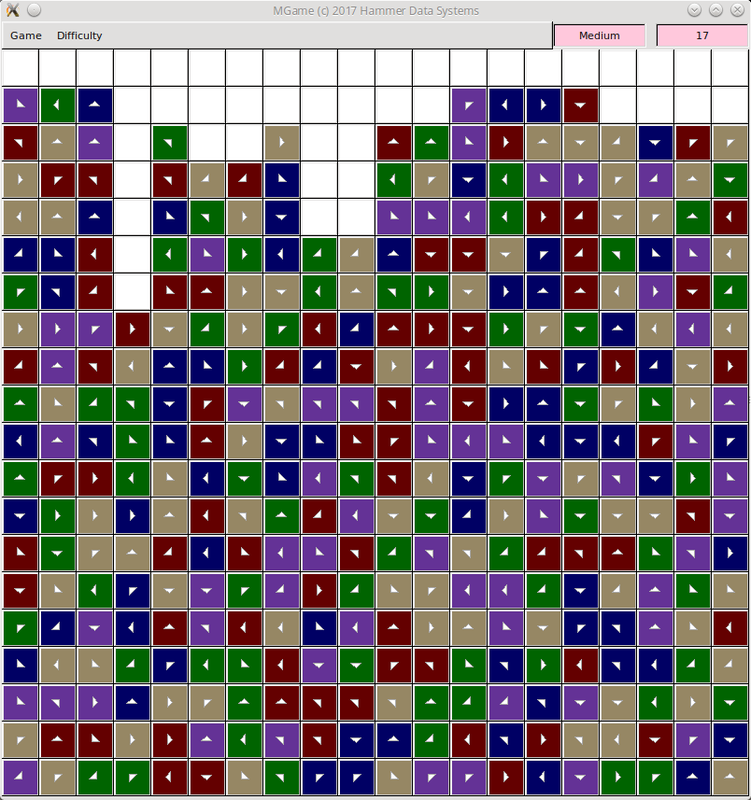 To match squares you must toggle the position of two adjoining squares by clicking on one and then another. Squares adjoin horizontally, vertically, or diagonally. 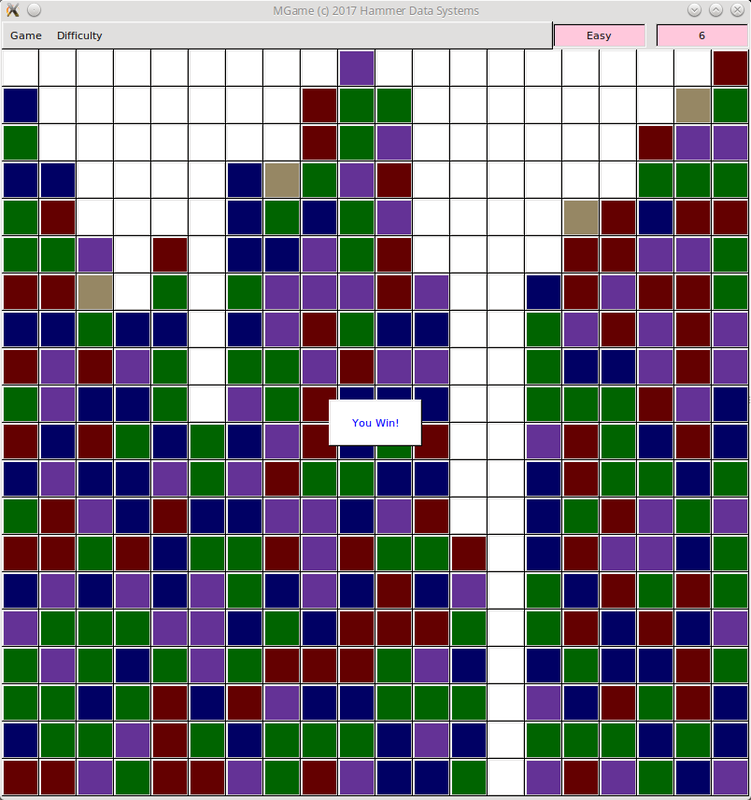 Every time you toggle squares, a new row of squares appears at the top and drops into position. The .zip file contains excutables for Windows and Linux and a set of .wav files contained in a directory called "CowGame". You win by extending a white column from the top to the bottom. You lose if there is no room at the top (no white spaces) to add new blocks. There are four levels of difficulty: Easy, Medium, Hard, and Stupid. 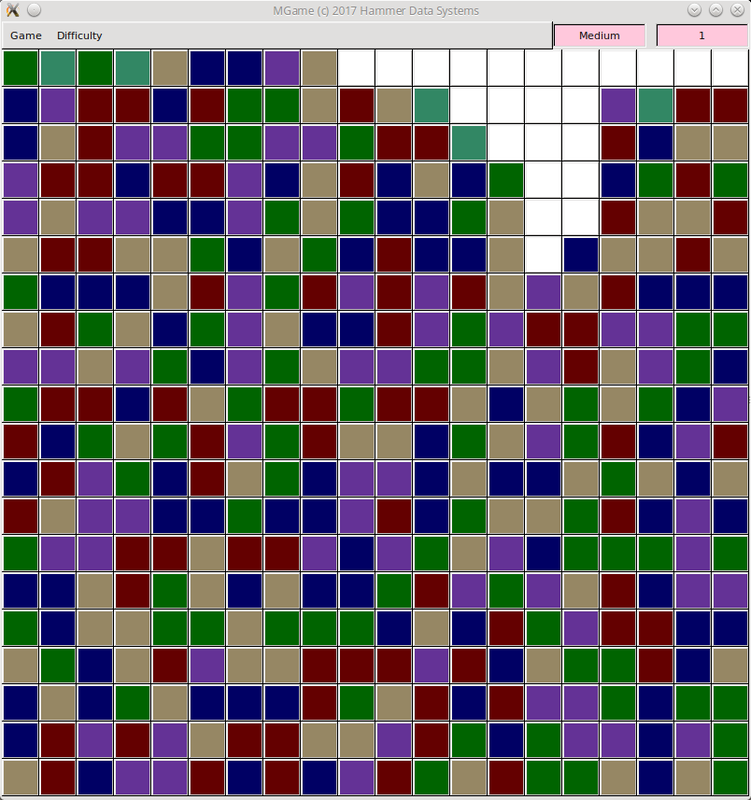 Easy mode has fewer colors and only has a 50% chance of dropping a new block into any one empty square on the top row. Hard mode has more colors. Stupid mode has more colors and if a move does not make a match a black block replaces the first clicked block. Black blocks cannot match nor swap positions. If every column has at least one black block, you lose. There is also "arrow mode". Arrow mode can be applied in any of the four levels of difficulty. In arrow mode, the block can only be swapped with the block pointed to by the arrow in that block. Clicking on the block will cause it to swap immediately. Turning the mousewheel up will turn the arrow clockwise. Turning it down will rotate the arrow counter-clockwise. Be careful, turning the mousewheel one "click" counts as a turn and new blocks will drop. The .wav files used by this program and included in the .zip file, were collected from web pages that represented them as public domain or otherwise free to use and distribute.